A perfect use for your left-over holiday turkey, this delicious soup can also be made with store-bought rotisserie chicken. If you can find pre-cooked wild rice, you can also save some time. Otherwise, it's easy to cook up your own wild rice. If cooking your own wild rice, start the wild rice cooking about 30 minutes before starting the soup. To cook the wild rice, combine 1 cup uncooked wild rice with 4 cups water in a saucepan. Bring to a boil, then cover and reduce heat to low. Allow to simmer, covered, until all the liquid has been absorbed, about 45 minutes. In a large Dutch oven or soup pot, heat oil over medium heat. Add onion, carrot and celery and cook, stirring, about 3 minutes. Add the thyme leaves, mushrooms and garlic. Cook, stirring, until mushrooms are starting to brown, about 5 minutes. Add broth and 1 cup water. Bring to a boil, then reduce heat and simmer 8-10 minutes, or until the vegetables are tender. Add the kale, salt and pepper. Cook, stirring, until the kale wilts, 1-2 minutes. Add the cooked turkey (or chicken) and stir to combine. In a small bowl, combine the half and half cream and the flour. Whisk mixture well until there are no lumps. Stir this mixture into the soup and cook, stirring, until soup thickens. Taste soup and add more salt and pepper, as needed. 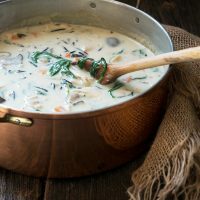 Add the wild rice: If you will be eating all the soup right away, simply add the cooked wild rice to the soup and stir to combine, heating for a few minutes, if necessary. If you expect to have soup for left-overs, it is best not to add the rice to the soup, but rather to spoon the hot soup over some warm wild rice in each bowl, then stirring to combine. The reason for this is that the wild rice will absorb all the liquid from the soup as it sits in the fridge. If you keep them separate, you won't have that problem and your left-overs will be as great as the freshly made soup!